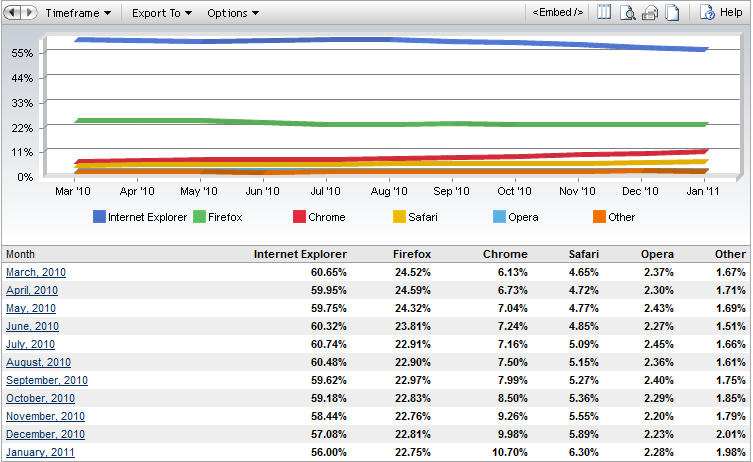 With a great year for web browsers that 2010 was, it’s time to dive in directly into 2011 and check the very first month market share stats. Internet Explorer continues the downtrend with a 1.08 point drop, from 57.08% to 56.00%. With the upcoming Firefox 4 release, Mozilla’s web browser is still struggling to gain any significant market share, this time it lost a 0.06 point, down from 22.81% to 22.75%. As stated in the title, Google Chrome has now more than 10% of the market share, up from 9.98% to 10.70% (0.72 point increase). Just as iPhone and iPad popularity grows, so does Safari’s market share, its market share has now increased by a 0.41 point, from 5.89% to 6.30%. With the release of Opera 11 Final, Norwegian web browser gained 0.05 point of the market share and went up from 2.23% to 2.28%. 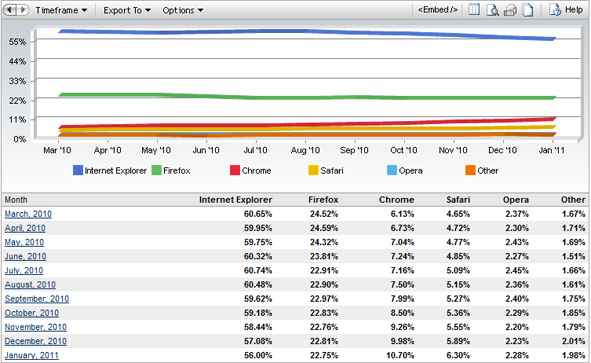 This shows how rough and inaccurate browser market share stats are: Statcounter shows a fall of opera by 0.07%, net applications/Hitlinks shows a rise by 0.05%…. StatCounter have bad methodology. They only show all measured data with no weight. When they receive more hits from USA than rest of the world, it will be call as Global data. Statistic from Netapplications have same problem and in June 2009 they change methodology. Compare their old data from May 2009 and from July 2009.